Dostál, J. Reflections on the Use of Interactive Whiteboards in Instruction in International Context. The New Educational Review. 2011. Vol. 25. No. 3. p. 205 – 220. ISSN 1732-6729. Beauchamp, G and Parkinson, J (2005) Beyond the wow factor: developing interactivity with the interactive whiteboard. School Science Review (86) 316: 97–103. Glover, D and Miller, D, Averis, D and Door, V. (2005) The interactive whiteboard: a literature survey. Technology, Pedagogy and Education (14) 2: 155–170. Smith, H.J. , Higgins, S., Wall, K., and Miller, J. 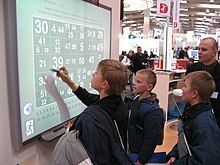 (2005) Interactive whiteboards: boon or bandwagon? A critical review of the literature, Journal of Computer Assisted Learning, 21(2), pp.91–101.